Most of us shoot a whole lot of pictures, and very few we use. The reason is that we have a lot of pictures that we like, but is really not that good for the 'public'. After all, we are our own worst critiques..
How many pictures don't we have that we feel something is missing... Oh, if it had only had this and that, or the sun was shining to give it more life, or, shoot! I wish I had another background..
Like I promised in my very first BLOG entry, I will share tips and hints, and this time, we will do a VERY simple step-by-step, using textures. Bearing in mind that you are a new beginner at this. 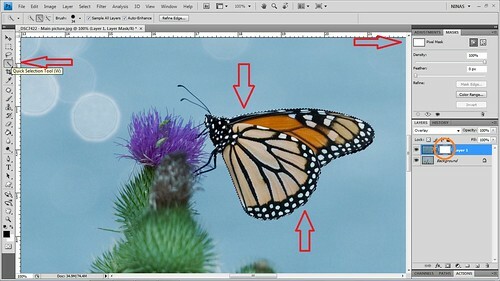 It is many many ways to do things in Photoshop, and it's up you really, to find the way that works best for you. What I will show here, is only one way to do it. In my opinion, it is the result that counts, not how you get to the result. First you have to make sure that you have set up you PS (PhotoShop) the way you like it. If anyone has questions about how to do that, I will BLOG about that later on. Using textures means that you have one MAIN picture, and in addition another picture that you want to use for the main picture. It can be one, two, five or ten texture pictures that you can use, but this time, we will only use one. 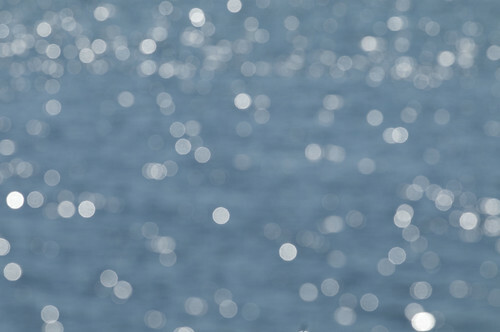 Your texture picture can be anything you like, like mine here, is a shot, out of focus of water sparkling in the sunlight. 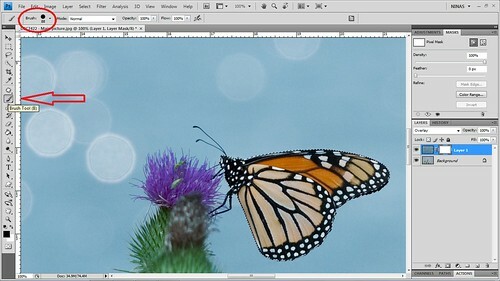 I want my butterfly to have another background, as I think it's missing in my main picture. It is important that both pictures are exactly the same size. You will now only see your texture picture as it is laying on top of the main picture. Close your texture picture, as you will not need that anymore. Just click and hold, and move your texture picture around over your main picture. Note that you have new layer called 'Layer 1'. This is the layer where of both pictures together. 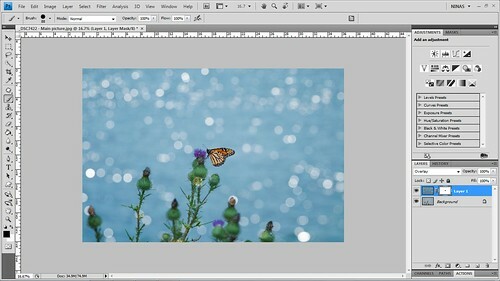 Then we want to, in a way, get the texture picture behind our main picture, so we can see the butterfly again. The butterfly is back in the frame. The colors have changed a wee bit, because now, the texture picture is like a thin film layer over the main picture. 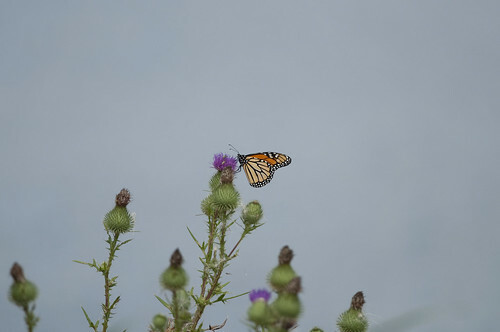 I am happy with the color change on the plant, but not on the butterfly. I want it in front of the texture layer with it's real colors and structure. 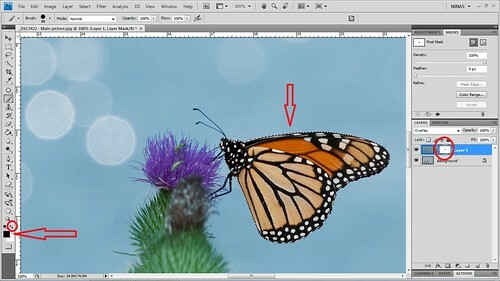 And to make that, we need to remove the texture layer on the butterfly. Now, to be able to see what we are doing, zoom in on the picture. It is easily done by using the keys: CTRL and + for zoom in, or - for zoom out. iMac is the same with the + and -, but with the Apple key, I think it's now called 'Command'. After zooming in on your picture, we have to add a 'Pixel Mask'. You will now see that you have a new white frame called 'Layer Mask Thumbnail' in your Layer 1 slot. This is the one that needs to be active, not the other one called 'Layer Thumbnail'. This is important to make this whole thing work. Around the edges of the 'Layer Mask Thumbnail', you will see an additional 'frame'. This tells you that it is active. Now I will give you a very valuable tips. Remember when you were coloring pictures when you were a child? The trick was not to color outside the lines. That is what we will do now, in a way. You can control the size of your brush/circle by it's menu on the menu line (see picture under), or simply, for PC, hold CTRL and ALT keys while also holding your right mouse button, moving your mouse from left to right. You will see that the brush/circle will change it's diameter. A little more advanced tips on how to use the 'Quick Selection Tool'. When just clicking and dragging with your mouse, the area will be marked. If you want to remove some of it, hold ALT in and move your brush over the area you want to remove. You will see that your marking is disappearing. Now, I am happy with my marking of the butterfly and want to get the real color again. The reason we did the making is that when we now start 'coloring', we will NOT go on the outside of the marking. Again, if you want to change the diameter of your circle, the procedure is the same as with the 'Quick Selection Tool'. But, we made a marking, that stops us from going outside of the line, so the size of the circle does not really matter. Look at my picture over. See the black and white squares? To make this work, make sure you have the 'Layer Mask Thumbnail' active, and the black square is on the top of the white. The black means: Remove. The white means: Add back. Move your brush over the marked area (without getting afraid to go outside of the lines). You will see that the original color of the butterfly is coming back. Try switching to the white square over the black (the little circle I've marked in red over the squares). 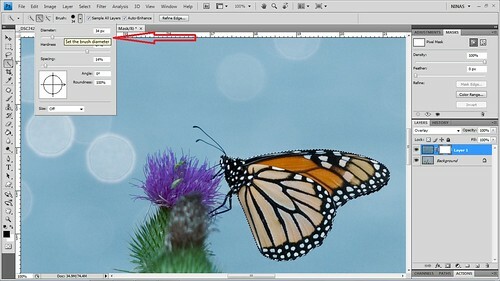 You will see that you are adding back the texture layer on the butterfly. Change for black again to remove. Also now, if you look at your 'Layer Mask Thumbnail', it will be a little marking in black inside. This means you have removed something, which you have. You have removed the texture layer over the butterfly only, but kept it in the rest of the frame. To get rid of the marking, click CTRL and D (Deselect). 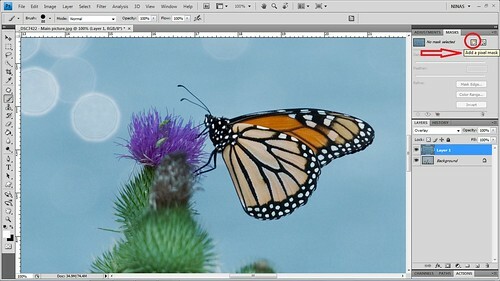 The butterfly stays unchanged, and the texture layer disappears. Then, it is all up to you, to crop, use curves, saturation or what ever your heart desires to make your finished product. Many times we know already what we want to make, other times it comes to us while playing and trying out different things. In a few simple steps you have learned how to use an additional picture to make something 'artsy'. Now, if you have some imagination and are creative, you will understand that this procedure can be used for many many things, creating a whole lot of different images. CTRL and ALT and Z = One step backward. This is your way to regret something you just did.